Net.Shark is a FPGA based Tap with filtering capabilities, that connected in pass-through mode, is able to capture traffic at wire-speed. Packets are transmitted through two ports and traffic compliant with one of the filters is sent to Wireshark. 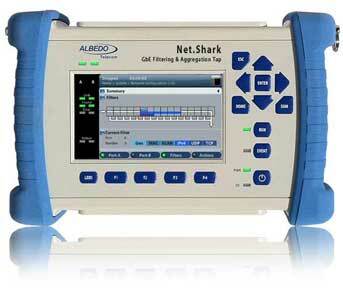 Wireshark is a network packet analyzer to examine communication network. Important features are: live packet data capture, display packets with very detailed protocol information, open/save data, import/export from/to other programs. It can search/filter data on many criteria. Wireshark is open source and probably the best packet analyzer available. Mirror ports may not provide 100% of network traffic if they are over-subscribed because this process works in background in low priority; moreover it may not even be available for use when necessary. It may also occur that to monitor multiple network channel or VLAN simultaneously and aggregate the data to your network analysis cannot be possible because of the complexity of the set up and execution process. PCs executing protocol analyzers like Wireshark lack power capacity and traditional taps cannot be moved easily and always depend on another external device because are not self contained. Once you get the traffic there are still limitations such as FDX capture, jitterless timestamp, or field storage of captured data that may only be overcame with a hand-held field tap such Net.Shark. 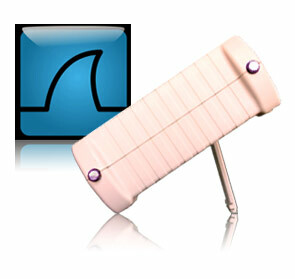 AT.NShark.HH NetShark hand-held. Battery operated tap including 2 Line ports (SFP interfaces supporting 10BASE-T, 100BASE-TX, 100BASE-FX, 1000BASE-T, 1000BASE-SX, 1000BASE-LX, 1000BASE-ZX), 2 Mirror ports (RJ45 interfaces including 10BASE-T, 100BASE-TX, 1000BASE-T), aggregation function in one mirror port, SD card storage in PCAP / PCAPNG format with hardware timestamps. Includes AC/DC adapter, transportation bag, two units of RJ45 SFP transceiver (10BASE-T, 100BASE-TX, 1000BASE-T). AT.NShark.NS Network Search. Automatic detection of up 16 most frequent streams listed by IPV4, IPV6 VLAN and MAC. AT.NShark.POE Power over Ethernet bridge. PoE / PoE+ pass through as per IEEE 802.3af and IEEE 802.3at.